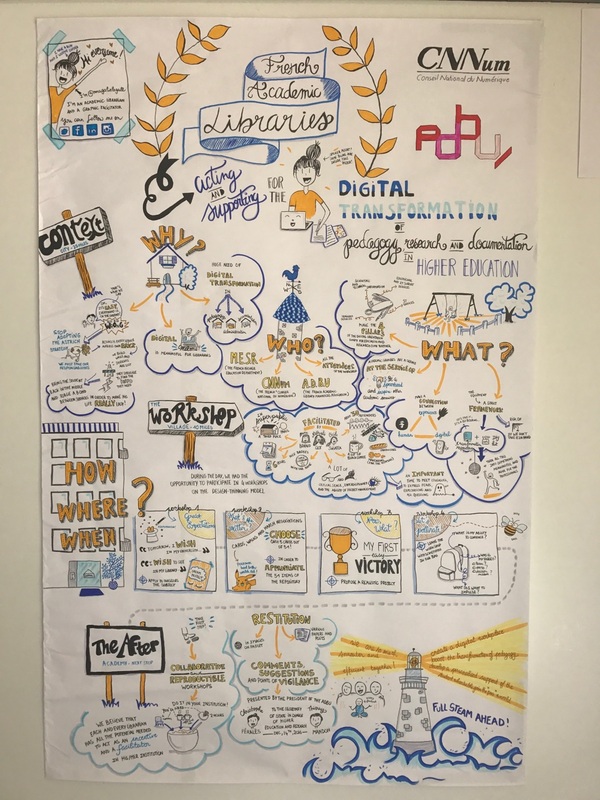 SWIATEK, Cécile and LE GALL, Magalie (2017) French academic libraries: acting and supporting for the digital transformation of pedagogy, research and documentation in higher education. Paper presented at: IFLA WLIC 2017 – Wrocław, Poland – Libraries. Solidarity. Society. in Session 112 - Poster Sessions. 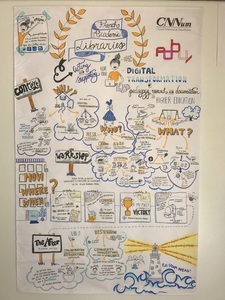 The French academic library managers association (adbu) is now identified in the French higher education landscape as a key-partner in order to help any librarian who wishes to engage digital transforming processes by implementing similar workshops in his/her institution, consistent with national orientations. Context: In 2016, the French Conseil national du numérique (CNNum) organized collaborative workshops on a design-thinking model, in which the French Association for academic libraries Directors and managers was acting as both a partner and a DIY-workshop kit tester. National advocacy and leverage: following the partnership with the CNNum and this librarian-designed workshop, adbu provided CNNum with comments, suggestions and points of vigilance from library professionals, with a view to integrating in the best manner the human resources and action repository for transforming pedagogy/research/documentation digital policy and practices in both the local and national French higher education. This framework (transformation repository and DIY kit for setting up a collaborative workshop in one’s working environment/institution) was presented to the Secretary of State in charge of Higher Education and Research, Mr. Thierry Mandon, on December 14, 2016, along with the the co-design methods of these collaborative and reproducible workshops. Local pollinating: the adbu cross-pollinated this collaborative workshop model aiming at engaging digital transformation processes at a local level, considering that each and every librarian has all the potential needed to act as an incentive and a facilitator in his or her institution. You will find the restitution in images of the adbu workshop that took place on December 7, 2016 on https://padlet.com/AdbuPedagogie/TransfoNumeriqueESR . Various papers and posts were published in France about this initiative. Today, some academic libraries started working on a local institutional background : they suggested and impulsed collaborative meetings and workshops in order to enhance or accelerate their institutional digital transformation.